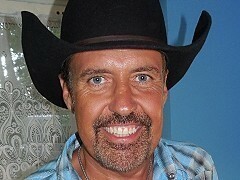 Billy Yates is an international country star, who has developed large fan bases in various parts of the world. Starting out as a demo singer, Billy got attention when George Jones recorded his song "I Don't Need Your Rockin' Chair" with 10 major country stars of the day, which resulted in the CMA Vocal Event of the Year 1993. 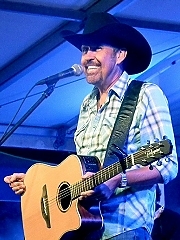 Billy has written songs for the likes of George Strait, Trace Adkins, Randy Travis and he also penned George Jones' comeback song "Choices". 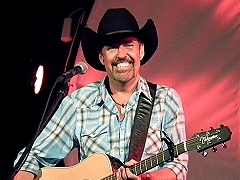 He's very popular as an artist in his own right as well and his traditional honky tonk style pleases fans around the world. 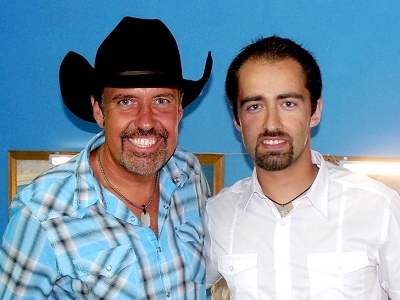 I talked to Billy at the Pure Country festival in Wolsztyn, Poland last year. Let's start with some serious issues. What was the last time you cut somebody's hair? (starts laughing) "You know what, actually I cut my son's hair a while back and probably my own. I trim mine all the time. But it's funny that you brought that up, because I was a barber for about ten years. Five years in Missouri, five years in Nashville and it was a good time. My dad was a barber for forty years and I grew up in the barber shop and I was around that, so when I got in a high school, of course I was looking for something to do to get me into the music business, to give me time to do music and that worked out really well." Over the years you've been really huge here in Europe and the audiences are apparently really appreciative. Do you approach the concerts in Europe differently from the ones in the US? "As far as approaching it differently, no, I really don't. I've always understood what I stand for and I've always done music that I feel compelled to perform, so nothing really changes. I take the same kind of approach in the States as I do here, it's all the same to me." A couple of years ago you recorded a tribute song to Norway. 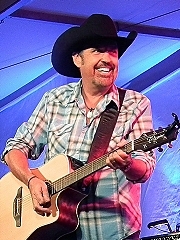 When Alan Jackson went on his first European tour in 2009, he was supposed to play a show in Norway, one in Sweden and one in Denmark. The show in Norway sold out in two days and the show in Denmark didn't sell at all and was eventualy cancelled and an additional show in Norway was added, which sold out within a few days again. To me it was really surprising because I thought that people from Switzerland, France and Germany would all go to Denmark. 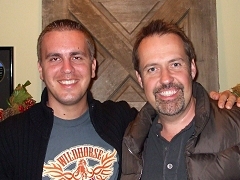 Where do you think that this magical passion for country music in Norway comes from? "All the different countries I visit, every country has their beauty on their own, their own way that I appreciate and enjoy. And I enjoy the different cultures. One thing about Norway is, of course, the beautiful scenery and the beautiful landscape there. But there is really avid country fanbase in Norway and I don't know why, my guess is that it comes from years and years of kind of nurturing that. It's a good place to go." "Why somebody won't sell one place from another, it's hard to say and I find it even for myself. You know, I've invested the largest part of my carreer in Europe and in the UK and I still find pockets where country music may be even more popular or whatever. That's interesting, too. It doesn't really matter how big star you are in the States. There's still places where they don't really know you and I think that's something that's difficult for a lot of Nashville people to understand, because they think of our superstars as global artists. And some are, some aren't. You can sit in a room with people depending where you're at, you can bring up names like Kenny Chesney, some of our current superstars, and they don't know who they are. That applies sort of across the board for every artist, myself included." "I go to places where they don't have a clue who I am and it doesn't bother me. I mean you just try to win over people wherever you go and that's something that comes naturally. I love people and I found when you love them, they love you back. It's the most important thing for me when I do a show to get that across. And it's worked in a good way. On a personal level for me it's worked, because I love to feel that love back. It's sort of addictive." Have you played on any other continents except from America and Europe? "Last year we were in China and Japan, looking at going to Australia next year. I'm trying to branch out and do more and at the same time I don't want to neglect what I've built in Europe. There's still a lot for do. There's still a large fanbase to tap into and more people to take this music to, so I just look at every opportunity that comes along. The trip to Japan and China was interesting and it was really good. Japan was amazing, there's a really good country fanbase there." Did George Jones have a chance to listen to your tribute song before he passed away? "He did. I wrote the song back when I was in Ireland and when I got back to the States, I sent it over, I called Nancy up and I told her about it and she told George and George wanted to hear it. And they loved it. George got a kick out of it, because it honored him. So I was really proud of that. They had plans to do another record and he said 'maybe we can make that a centerpiece and have people come and sing on it' and of course, that didn't happen. I'm proud that he got to hear it. I'm proud that it's the title cut to my latest CD, because George Jones was such a huge influence on me. Musically, as a child, and on and on as an adult as well. And it's just a really special thing that he heard that song. It's meant a lot to a lot of people now that he's gone." What do you remember most about him? "Oh man, there's some many memories. The great thing was just to become friends and there was just so many private moments, things we laughed about and we saw eye to eye a lot of things mainly in the music business. We agreed on a lot of things. He loved to laugh. He was a fun and normal guy. What many people don't know about George I think he sort of suffered from stagefright. When he walked on the stage, he was very nervous. I sat on a bus with him before he walked out to do a show, he'd be wringing his hands and was nervous before the show." "I think it also goes back to the whole alcohol thing, it goes back to the duets partners and the security thing that he needed and my God, I love him. It's one of those things that some people can overcome, some people can't and it sort of feeds the demon, for him the alcohol was his demon and luckily he was able to overcome it later in life and he got things right." "I think George was such a stylist and if you really get into the nuts and bolts of what makes great singers, being able to exude that emotion. George was the master of that. In my mind, maybe technically, some would say maybe he was a perfect singer, maybe he wasn't, you can argue those things, but to me he was, because he was able to sing with so much emotion. You felt it. Someone asked me one time 'do you think he really feels what he's singing, because he's been singing those songs for so long and he still sings them that way?' and said 'I don't know, chances are he doesn't feel it everytime he sings it and he doesn't think about what he's singing because sometimes you do that when you're doin g shows, but he was still able, if that was the case and I have no idea, but he was still able to get that emotion across everytime and you see people in the audience crying, you see people laughing. He had that whole way about him that he could make people feel something." When you wrote "I Don't Need Your Rocking Chair", did you have all those guests on your mind? "No. You know, it's funny because it was the very first song that I ever had recorded. And I didn't even call myself a songwriter at that point. I was just trying to learn how to write songs. And I was lucky enough to get in a room with a couple of great songwriters that knew what they were doing. They used an old tired melody that I came up with and put that together. And the publisher that I just had started working for sent it over to MCA. They sent it out to George, he was on the road, and I got and phone call. I had met George before, but I didn't know him on a personal level. And he called and said 'man, I love this rockin' chair song, we're gonna do it next week'." Did you get to meet all of the artists? "You know, most of them I've met. I wasn't there when they recorded that part. I was actually invited to be there, but that was during Fan Fair and I had commitments at the fairgrounds. It was the very same day when they shot the part of the video and the recording of all the artists. They were all in the room together. I've got a 5-hour video that just goes on and on and on of them trying to get that parts right. It's a really funny video to watch some of them struggling." "Interesting was when it was over, they were through it, and Garth Brooks was supposed to come in and sing on it. This was the day, if you remember, he was signing at the fairgrounds for like 24 hours and broke all the records. It was the same day. So he got to the studio and the film crew, the engineers, they were already packing up to leave and he was like 'please, I'll pay for the studio time, but I have to sing on this', so they gave him the very last line. And in the video you can see he's so visibly tired and exhausted from singing autographs all day." "It was such a great way for me, it was such a confidence builder, because like I said I didn't consider myself to be a songwriter. It gave me a new confidence and also opened a lot of doors in a lot of ways and made my life easier. It's crazy. You know, different people, like Joe Diffie, have recorded my songs individually on their own, but I don't know if it's fair to say that I've had songs recorded by Garth Brooks. He sang on one of my sings and that's fair to say. That's pretty cool." Were you present at the CMA Awards in 1999 when Alan Jackson sang Choices? "I was. There was a rumor that went around that day and I'm sure Alan had practised the song with his band. So the word got around a little bit. Somebody called me and said 'hey, I think Alan Jackson may sing 'Choices.' It was all because the CMA had asked George to do just a small piece of the song and George felt like he should be able to do the whole song. He was very proud of that song. And he was very proud of the radio airplay that he got and the success he had that way." "And he thought he should do the whole song and the CMA said 'no, there's no time, you have to do this'. So he sort of rebelled and said 'so I'm not gonna come'. So he stayed home. The local radio stations made a big deal out of it and the media got a hold of it and it was a pretty big deal." "So when Alan went into 'Pop A Top', it was his current single at the time, so I sit at the awards show and he starts doing 'Pop A Top' and my heart sank and I thought 'he's not gonna do it, this rumor's not true'. And then he just does a little piece of 'Pop A Top', stops the band and he goes into 'Choices" and the whole crowd and myself, I might have been the first one up, I couldn't believe it. It was a very special moment in country music history for an artist to stand up for an older artist like that. Kudos to Alan Jackson for doing that." Yeah, I still play the video over and over. And I also love the video from a few months later, when Alan introduced George at the ACM awards, and George walked on stage and started singing: 'pop a top again'. "Yeah, and he said 'oh, this is a wrong show or something,' yeah. That was great." You were a huge idol for Peter Dula. Is he still an inspiration for you until this day? "Hopefully he knows what an inspiration he was to a lot of people. Not just for his music, but the way he had a determination in the fight to overcome what he had going on. I think I told you before, but it's like I think I would have given up, I couldn't have fought it. And to watch Peter, it kind of gave me a different feeling about all that stuff. And if I'm ever in that situation, I think that Peter would continue to inspire me. One thing about Peter that I think is interesting, the things he experienced in the music business, the stages he got to play on, the people he met, the people who respected him, I compare to Hank Williams Sr, because in a very short life he was able to do so much and have such an impact. That rarely happens. For most people it takes a lifetime to do that, so it was Peter's lifetime and even though it was short, it was impressive." I remember when he told me how moved he was when you let him play at your showcase and how he got to meet people like Michael Peterson and Andy Griggs. "You know, I wanted him on that show so bad, because I knew what he was going through and I knew what it would mean to him and I knew what I meant to me to have him there. But I also knew that he would get to meet a lot of people and I knew it would mean a lot to him. He was such an enduring loving sweet guy. People that met him, they all loved Peter and that happened in a big way of the show that night. I briefly told the story and everybody that was there, they fell in love with Peter because of his story and what he was going through. And he just walked out there just like a champion and nailed it. It was incredible. And he kept in touch with a lot of those people. A lot of people became fans that he corresponded with and stayed in touch with. It was very special." I talked to Peter on S kype every day that week and I remember how devastated he was because it was right after his major surgery. He was in Nashville for Fan Fair, which was what he had dreamt about for years, and when he finally got there, he had to stay home and was unable to go out because of a danger of an infection. He missed Mark Chesnutt's fanclub party and he could only play the Opry with Joe Diffie and then your show. "You make a lot of friends in the business. It's the people you meet. And so Peter being one of those to me is like a real highlight, but I think about all the great people that I've met in my life from movie stars to just normal people that impressed me and meant a lot to me. Peter, even though he was a great artist, he was also such a wonderful human being and that's a real highlight to me to get to know him." A few years ago you recorded a song called "Like A Radio" and I can't help myself but it sounds so much like Brooks & Dunn to me. Was it intentional? (laughs) "You know what, I spent a lot of years in Nashville being a demo singer. And I recorded this song as a demo to pitch to Brooks & Dunn actually. I sort of channeled Ronnie's voice and tried to mimic his sound and so it was. And Ronnie Dunn loved the song, they came close to recording it, but they never did. I felt like I wanted to put it on one of my records, because it was a cool song. And I try to get a good blend on the record, you know I try to have something for everybody. Even though my main love is more traditional music, I happen to have things that are more contemporary music on my records. And those tend to be the favorites for certain people. So yeah, it's a fun song." Years ago you recorded "Daddy Had A Cardiac" to the tune of Pam Tillis' single "Betty's Got A Bass Boat" from 1995. I'm wondering whether it was an intention or whether it was just Craig Wiseman, who wrote both songs, and if he just recycled an older tune of his." "We wrote 'Daddy Had A Cardiac' in 1997. Who knows. It was a story that I kind of brought in and then he jumped on this melody. And I wasn't aware he may have used it before. If it could be the case, I have no idea. We all do that. The songwriters, you kind of recycle something you did a while back without thinking about it. So who knows, a good question, but I really don't have the answer." Do you know anything about my country, the Czech Republic? "Not really. I've never been there, I'd love to visit one day. The funny thing in for the last ten years I've been touring all over Europe and I was never a big history buff. When I was in school, they taught us all these things, but I never really paid that much attention, because I'm just a small town kid and never thought I would ever see the things that I've seen. So now I've taken more interest and when I go visit places, I tend to learn more about it and the people and the culture and the history." "Yeah, same thing, people just don't pay attention, that's it, it's everywhere. People say I tour Europe all time time. I've seen articles that say 'Billy goes to England all the time.' I was like I go to England like once in two years. People just don't know, they don't pay attention to that stuff. It's nothing intentional. It's the same when you say you're from Nashville, people say 'oh yeah, that's where Graceland is and Elvis' and I'm like 'no, that's Memphis', so they don't know." That's right. OK, thank you for the interview. Billy Yates - "My Infinite Love"
(C) Petr Mecir 2014. All rights reserved.